So someone came to this site after that search from the ask link search? no, the question on the web page was "how do you molest little boys". that's what he's so creeped out about. 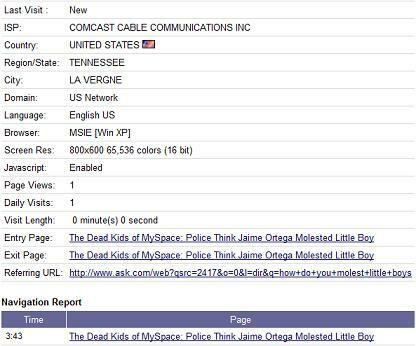 Did the person find "The Dead Kids of Myspace" with that search, "how do you molest little boys"? Well I'm sure it's probably nothing, although you never know. Obviously, there are a lot of disturbed and sick people out there. As for what they found was a link on the site to a separate story, I believe it's pictured on there. Just wait, you'll get much worse ones. Yea, sadly I kind of feared this.